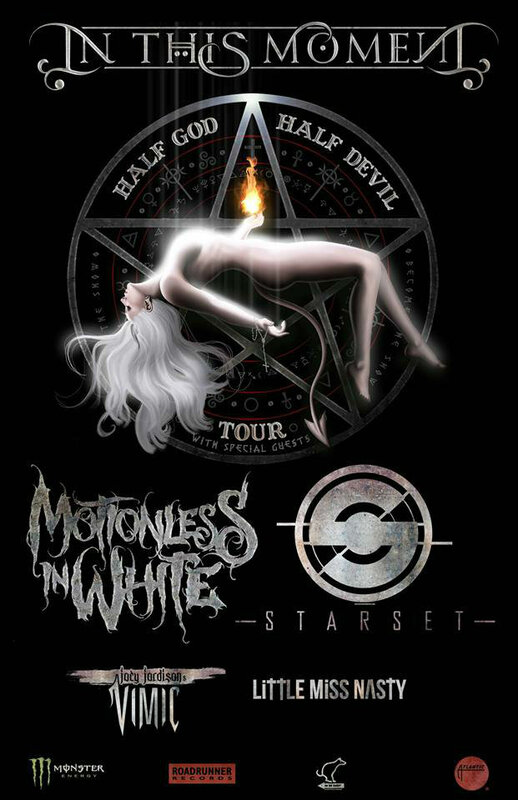 IN THIS MOMENT is currently criss-crossing North American on a mostly sold-out tour with MOTIONLESS IN WHITE and AVATAR, bringing its one-of-kind, burlesque-like show and visually captivating theatrics to thrilled fans and holding their rapt attention from start to finish. The band has revealed its summer tour plans, confirming that it will continue to tour with MOTIONLESS IN WHITE, along with VIMIC and LITTLE MISS NASTY, in June, through July and into August. STARSET will appear on a handful of dates. Additionally, IN THIS MOMENT will support AVENGED SEVENFOLD on June 19 and PAPA ROACH on June 23. IN THIS MOMENT kicked off a new North American tour, dubbed the “Half God Half Devil” trek, on April 7 in Milwaukee. The road trip continues until May 6, where it ends at the Carolina Rebellion festival. The road trip marks IN THIS MOMENT‘s first full-scale tour since serving as special guests on last year’s “Return Of The Dreads” tour with KORN and ROB ZOMBIE. 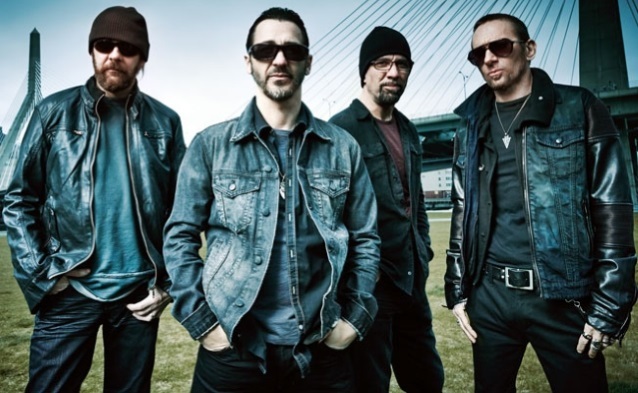 GODSMACK is continuing to write material for its seventh studio album. The new disc will follow up 2014’s “1000hp” and will commemorate the band making it to the two-decade mark. Its self-titled debut effort arrived in 1998. The new GODSMACK CD will also be its first effort for BMG, following a split with the band’s label home since 1998, Republic/Universal. GODSMACK signed the new contract with BMG last fall. The first release through the new deal was Erna‘s second solo album, “Hometown Life”, which arrived last September. Guitarist Tony Rombola and drummer Shannon Larkin also released a debut album last year from their recently launched side project, THE APOCALYPSE BLUES REVUE. 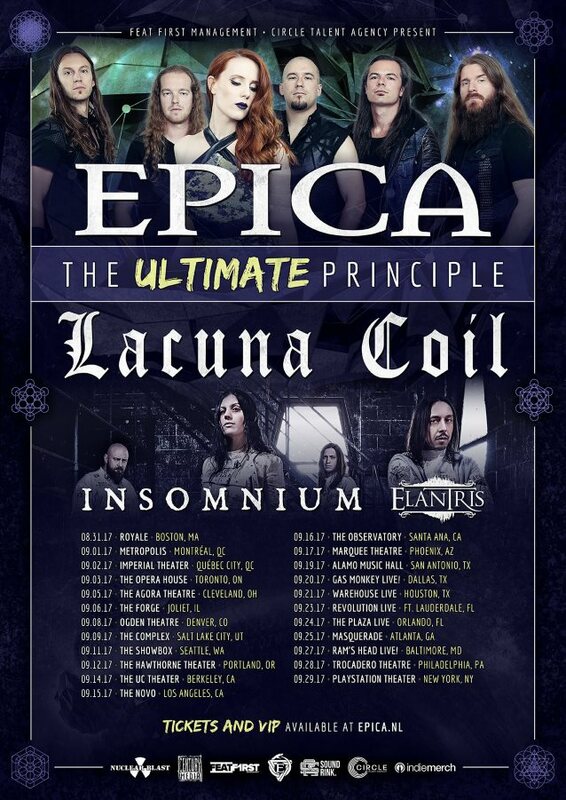 Dutch symphonic metallers EPICA will return to North America this August and September for “The Ultimate Principle Tour” with LACUNA COIL, INSOMNIUM and ELANTRIS. VIP tickets for this tour, including a meet-and-greet, photo opportunity with the band, exclusive merchandise and more, are on sale now through www.epica.vip. General admission tickets will go on sale this Friday at 10 a.m. local time. “The Holographic Principle” was released on September 30, 2015 via Nuclear Blast. EPICA recently finished touring Europe with POWERWOLF and BEYOND THE BLACK. 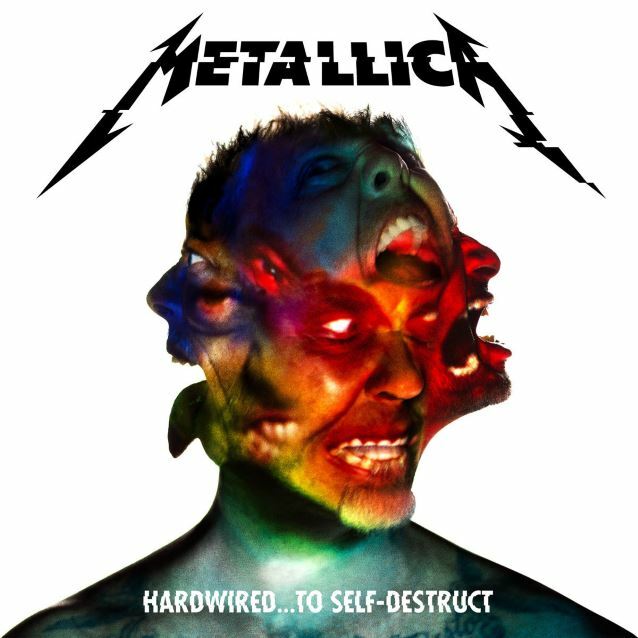 METALLICA’s ‘Hardwired… To Self-Destruct’ Album Certified Platinum In U.S.
METALLICA‘s latest album, “Hardwired… To Self-Destruct”, was certified platinum on April 12 by the RIAA (Recording Association Of America). The recent gain in “Hardwired… To Self-Destruct” sales is owed mostly to a concert ticket/album bundle sale redemption promotion with the band’s stadium tour that went on sale on February 17. Redemptions of albums included with the purchase of a concert ticket register as a sale in the week the customer redeems/receives the album. “Hardwired… To Self-Destruct” debuted as expected at No. 1 on The Billboard 200 album chart last November, selling 291,000 copies in its first week of release. Both of the band’s previous outings, 2008’s “Death Magnetic” and 2003’s “St. Anger”, sold more copies in shortened sales weeks. “Death Magnetic” moved 490,000 copies in a three-day window, while “St. Anger” shifted 418,000 copies in a similar frame. “Hardwired… To Self-Destruct” consists of two discs, containing a dozen songs and nearly 80 minutes of music. The North American leg of METALLICA‘s “WorldWired” 2017 tour kicks off on May 10 in Baltimore, Maryland and will hit stadiums in 25 cities before winding down in mid-August. Support on the quartet’s first North American trek since 2009 will come mainly from AVENGED SEVENFOLD and VOLBEAT, with GOJIRA taking over for the latter group for the last six shows. When art can’t be pigeonholed or pinned down, it elevates the very medium itself. 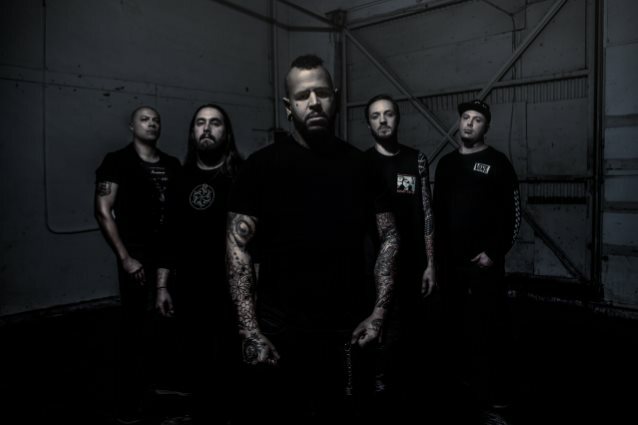 BAD WOLVES thrives on that sort of unpredictability, standing confidently at a crossroads between anthemic hard rock infectiousness and thought-provoking technically-charged heavy metal. Think a cross between the mind-numbing musical malevolence of MESHUGGAH and SEVENDUST‘s timeless irresistibility, and you’re halfway there… The vision of ex-DEVILDRIVER co-founder and previous driving force John Boecklin (drums, guitars) and vocalist Tommy Vext (SNOT, DIVINE HERESY, WESTFIELD MASSACRE) as well as Doc Coyle (guitar; GOD FORBID), Chris Cain (guitar; BURY YOUR DEAD), and Kyle Konkiel (bass; VIMIC, IN THIS MOMENT), the group’s full-length debut represents metallic evolution in its purest form. The result of a musical journey he kicked off in 2014, Boecklin describes the style best. “In no rush to put together something reminiscent of [his] musical past,” Boecklin quietly wrote over the course of 2015. During summer ’16, he entered AudioHammer Studios with longtime collaborator Mark Lewis (TRIVIUM, ALL THAT REMAINS) and tracked what would become the group’s debut album. Defined by a push-and-pull between incalculable instrumentation and soaring melodies, BAD WOLVES will keep listeners guessing and thinking on their path to hard rock and metal supremacy. REVOLUTION SAINTS heads into the studio next week in Italy to start recording its second album with producer Alessandro Del Vecchio, who also helmed the band’s debut album. Deen Castronovo (JOURNEY, BAD ENGLISH), Doug Aldrich (THE DEAD DAISIES, WHITESNAKE, DIO), and Jack Blades (NIGHT RANGER, DAMN YANKEES) will record a scorching set of songs written by Doug and Alessandro between the end of 2016 and early 2017. 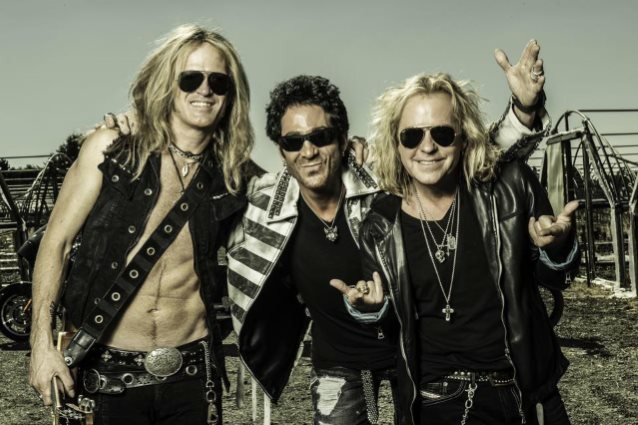 In between recording sessions, REVOLUTION SAINTS will make its official live debut at the Frontiers Rock Festival in Trezzo (Milan, Italy) where it will perform songs from its first album plus a few surprises. The band hopes to do more shows to promote the forthcoming album, which is currently set for a release in early October. REVOLUTION SAINTS was initially the vision of Frontiers president Serafino Perugino, who for years had hoped to work on a project where Deen would be the lead vocalist. Having previously worked with all three artists on different projects on Frontiers, getting Deen, Jack and Doug together was a dream come true for the president of the label. With production overseen by in-house Frontiers man Del Vecchio, the recording process for REVOLUTION SAINTS‘ debut happened in Portland, Oregon during the summer of 2014. Just weeks after announcing a 26-date summer tour of North America, QUEEN + ADAM LAMBERT have revealed further live plans for 2017, which will now see the band return to Europe later this year for a series of 24 dates, including 12 arena concerts in the U.K. and Ireland. The tour will showcase a spectacular new stage production and a set list that the band hints will provide some surprises. QUEEN + ADAM LAMBERT‘s 11-city U.K. and Ireland tour will kick off in Dublin on November 25. They perform in Belfast in Northern Ireland the following day, then reach mainland Britain on November 28 to play Liverpool’s Echo Arena. More dates follow in Birmingham, Newcastle, Glasgow, Nottingham, Leeds, Sheffield and Manchester, climaxing with two huge London shows at the O2 Arena on December 12 and The SSE Arena, Wembley, on December 15. Tickets will be on general sale from Friday, April 21, with pre-sales starting two days earlier, Wednesday, April 19. The tour is presented by Phil McIntyre Entertainments. For their 2017 tour, the band will unveil a brand new show including a specially designed state-of-the-art production. The choice of performance material will no doubt acknowledge this year’s 40th anniversary of QUEEN‘s biggest-selling studio album to date, “News Of The World” from 1977, which yielded the immortal anthems “We Will Rock You” and “We Are the Champions”. Adam Lambert welcomes the challenge of digging deeper into the band’s canon of classics. “What people should know if they came to the shows a couple of years back, is obviously we will still be playing the big hit songs you know and love from QUEEN, but we thought it would be good to challenge ourselves a bit,” he explains. “Change it up a little bit, change the visuals, change all the technology, change the set list to some degree. We will probably be pulling some other songs out of the QUEEN catalogue which we haven’t done before, which I am very excited about.